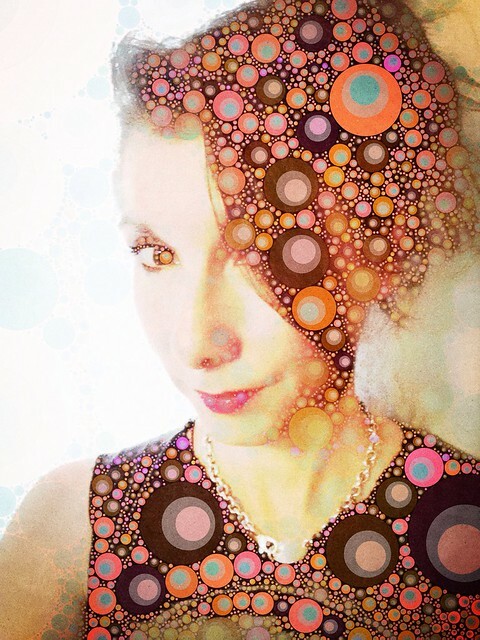 I started playing around with the Percolator app again since the latest update. You can actually spend hours just trying out the various different combinations and get so many different looks. The above portrait was made with the Tripstamatic “brew”. I was happy with the way this one came out because the shapes did not overwhelm the face, and the colors were very surprising. 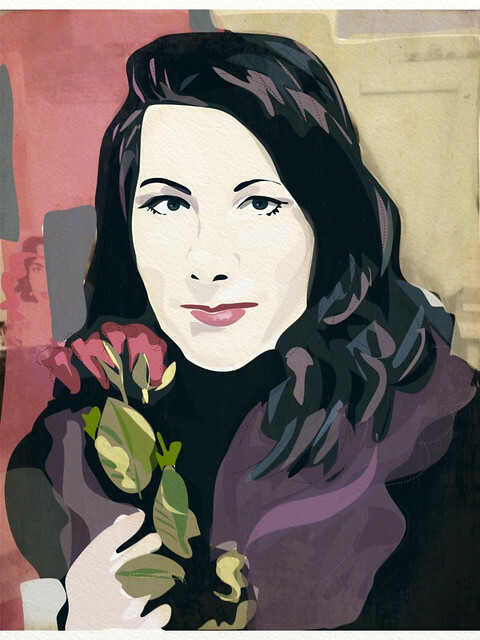 Below is the unpercolated version (though it does have the moreBeaute2 app applied to it). 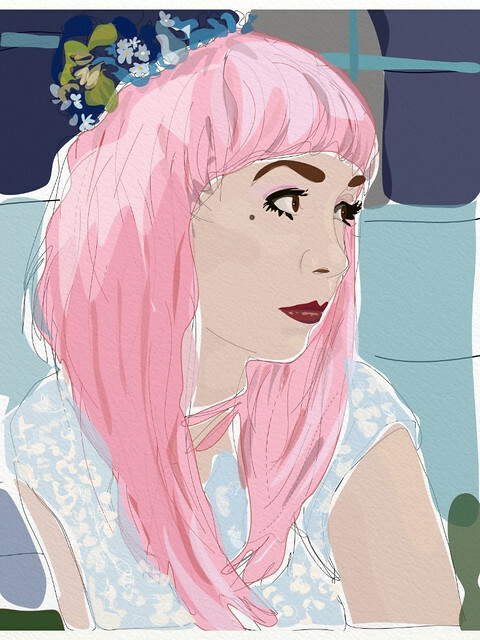 This is a portrait of blogger Polly Bland from a photo on her blog “The Littlest Polly”. 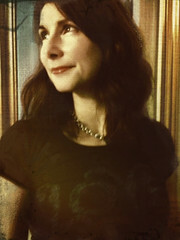 You can spend hours looking through the beautiful photos and posts on her blog. I love looking at her posts about her wardrobe and how she puts together her outfits. You can also visit her Etsy shop which has some amazing items. The drawing on top was created using Inkpad and Artrage for the watercolor paper textures. The bottom drawing is the underlying drawing done in Inkpad which I left on a separate layer than the color layer. This is a self portrait using the Inkpad, a vector drawing app on my iPad mini. I added in some collage elements from my photos and imported it into Artrage to give the picture a texture. 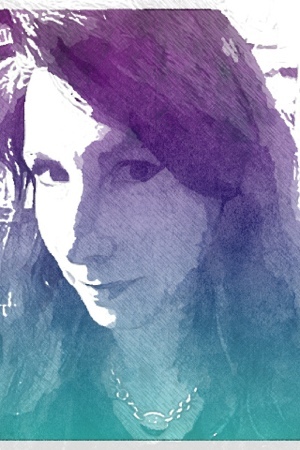 I am always trying to find an avatar for myself that I am happy with. I have lost count of how many “selfies” I have done. 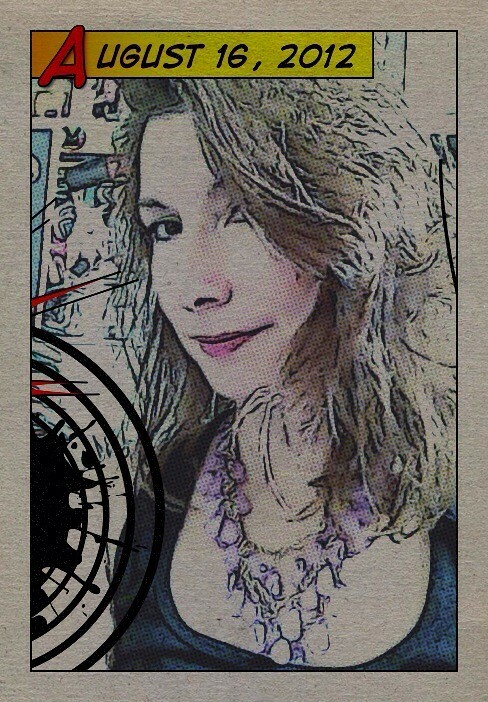 This is a self portrait taken with ToonCamera and then edited with the Halftone app. I am thinking of creating a new avatar for use with various sites like Twitter and Instagram. I really like using ToonCamera and Halftone together because they really compliment each other. 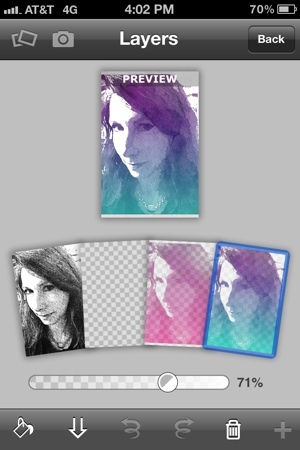 The result reminds me of a trading card. I will probably modify it to add my Twitter name, blog or QR code instead of the date. I wanted to experiment with making a mash up using the apps Popsicolor and Tooncamera. I used Tooncamera to first make a black line drawing. Next I processed the same picture using Popsicolor. 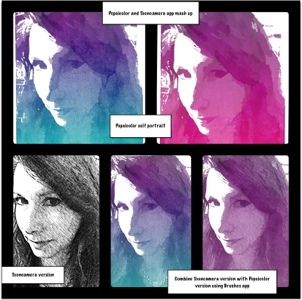 I imported the pictures into the Brushes app and used the layers function to combine the pictures. 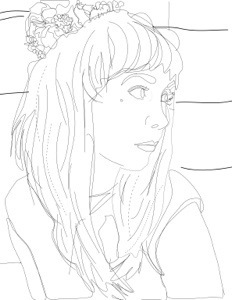 You can vary the transparency of each layer to make the lines in the drawing darker or lighter. 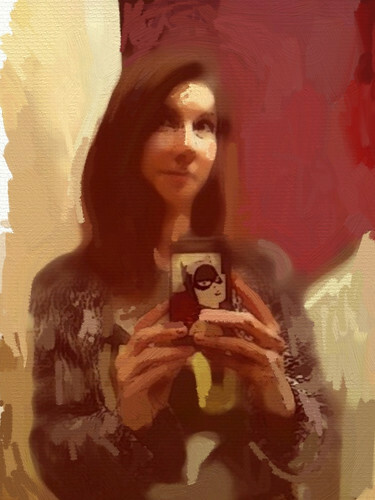 This is a self portrait using ArtRage. I was sort of inspired by “What I Wore Today” posts that I see on various blogs but found that taking an iPhone self portrait in a mirror is a little more challenging than it seems. I have one of my Batgirl Moo stickers on the back of my iPhone and I’m still thinking of having a new case made up with one of my designs on it. 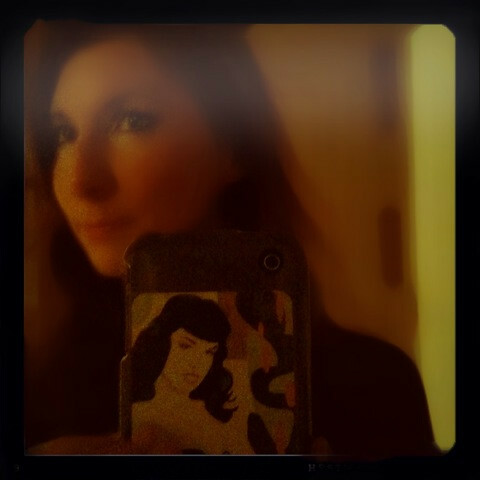 I decided to take some quick self portraits before going to the Mark Mothersbaugh show at Blast gallery. 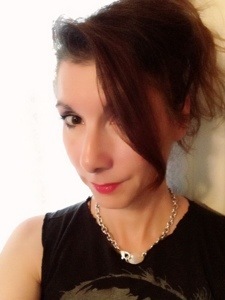 I love this Betsey Johnson dress and wear it whenever I’m going some place fun or art related. 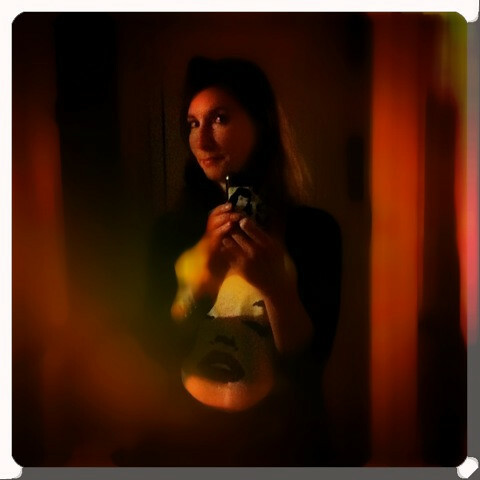 I find that darkly lit rooms and the Blur Fx app is a good (and inexpensive) alternative to plastic surgery.